Crypto-Jews of the Iberian Peninsula. The term, which is frequently derived from the New Testament phrase "maran atha" ("our Lord hath come"), denotes in Spanish "damned," "accursed," "banned"; also "hog," and in Portuguese it is used as an opprobrious epithet of the Jews because they do not eat pork. The name was applied to the Spanish Jews who, through compulsion or for form's sake, became converted to Christianity in consequence of the cruel persecutions of 1391 and of Vicente Ferrer's missionary sermons. These "conversos" (converts), as they were called in Spain, or "Christãos Novos" (Neo-Christians) in Portugal, or "Chuetas" in the Balearic Isles, or "Anusim" (constrained) in Hebrew, numbered more than 100,000. With them the history of the Pyrenean Peninsula, and indirectly that of the Jews also, enters upon a new phase; for they were the immediate cause both of the introduction of the Inquisition into Spain and of the expulsion of the Jews from that country. The wealthy Maranos, who engaged extensively in commerce, industries, and agriculture, intermarried with families of the old nobility; impoverished counts and marquises unhesitatingly wedded wealthy Jewesses; and it also happened that counts or nobles of the blood royal became infatuated with handsome Jewish girls. Beginning with the second generation, the Neo-Christians usually intermarried with women of their own sect. They became very influential through their wealth and intelligence, and were called to important positions at the palace, in government circles, and in the Cortes; they practised medicine and law and taught at the universities; while their children frequently achieved high ecclesiastical honors. The Maranos and their descendants may be divided into three categories. The first of these is composed of those who, devoid of any real affection for Judaism, and indifferent to every form of religion, gladly embraced the opportunity of exchanging their oppressed condition as Jews for the brilliant careers opened to them by the acceptance of Christianity. They simulated the Christian faith when it was to their advantage, and mocked at Jews and Judaism. 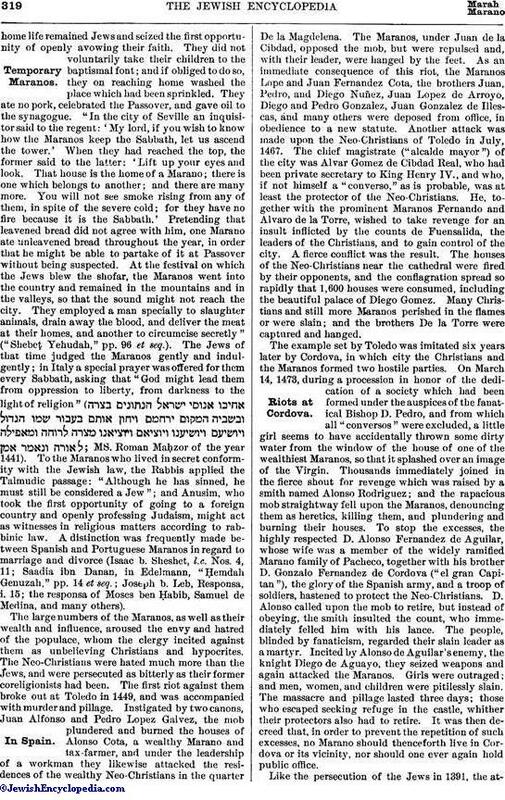 A number of Spanish poets belong to this category, such as Pero Ferrus, Juan de Valladolid, Rodrigo Cota, and Juan de España of Toledo, called also "El Viejo" (the old one), who was considered a sound Talmudist, and who, like the monk Diego de Valencia, himself a baptized Jew, introduced in his pasquinades Hebrew and Talmudic words to mock the Jews. There were also many who, for the sake of displaying their new zeal, persecuted their former coreligionists, writing books against them, and denouncing to the authorities those who wished to return to the faith of their fathers, as happened frequently at Valencia, Barcelona, and many other cities (Isaac b. Sheshet, Responsa, No. 11). The second category consists of those who cherished their love for the Jewish faith in which they had been reared. They preserved the traditions of their fathers; and, in spite of the high positions which they held, they secretly attended synagogue, and fought and suffered for their paternal religion. Many of the wealthiest Maranos of Aragon belonged to this category, including the Zaportas of Monzon, who were related by marriage to the royal house of Aragon; the Sanchezes; the sons of Alazar Yusuf of Saragossa, who intermarried with the Cavallerias and the Santangels; the very wealthy Espes; the Paternoys, who came from the vicinity of Verdun to settle in Aragon; the Clementes; the sons of Moses Chamoro; the Villanovas of Calatayud; the Coscons; and others. The third category, which includes by far the largest number of Maranos, comprises those who yielded through stress of circumstances, but in theirhome life remained Jews and seized the first opportunity of openly avowing their faith. They did not voluntarily take their children to the baptismal font; and if obliged to do so, they on reaching home washed the place which had been sprinkled. They ate no pork, celebrated the Passover, and gave oil to the synagogue. "In the city of Seville an inquisitor said to the regent: 'My lord, if you wish to know how the Maranos keep the Sabbath, let us ascend the tower.' When they had reached the top, the former said to the latter: 'Lift up your eyes and look. That house is the home of a Marano; there is one which belongs to another; and there are many more. You will not see smoke rising from any of them, in spite of the severe cold; for they have no fire because it is the Sabbath.' Pretending that leavened bread did not agree with him, one Marano ate unleavened bread throughout the year, in order that he might be able to partake of it at Passover without being suspected. At the festival on which the Jews blew the shofar, the Maranos went into the country and remained in the mountains and in the valleys, so that the sound might not reach the city. They employed a man specially to slaughter animals, drain away the blood, and deliver the meat at their homes, and another to circumcise secretly" ("Shebeṭ Yehudah," pp. 96 et seq.). The Jews of that time judged the Maranos gently and indulgently; in Italy a special prayer was offered for them every Sabbath, asking that "God might lead them from oppression to liberty, from darkness to the light of religion" ( ; MS. Roman Maḥzor of the year 1441). 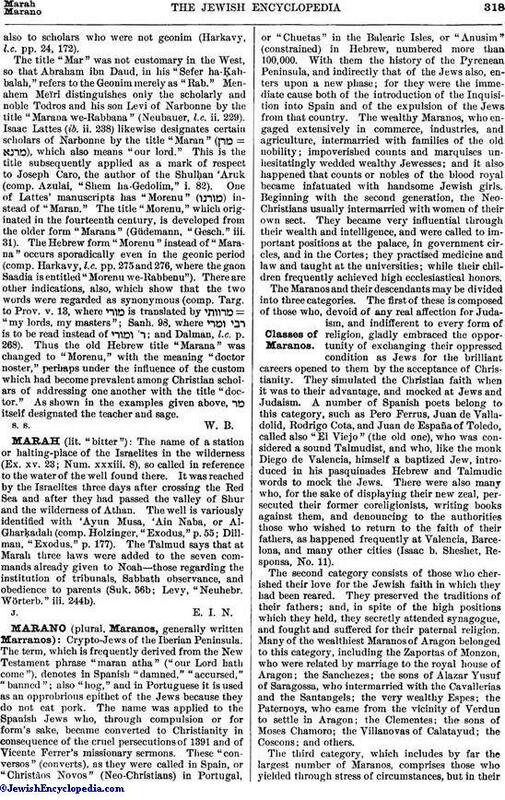 To the Maranos who lived in secret conformity with the Jewish law, the Rabbis applied the Talmudic passage: "Although he has sinned, he must still be considered a Jew"; and Anusim, who took the first opportunity of going to a foreign country and openly professing Judaism, might act as witnesses in religious matters according to rabbinic law. A distinction was frequently made between Spanish and Portuguese Maranos in regard to marriage and divorce (Isaac b. Sheshet, l.c. Nos. 4, 11; Saadia ibn Danan, in Edelmann, "Ḥemdah Genuzah," pp. 14 et seq. ; Joseph b. Leb, Responsa, i. 15; the responsa of Moses ben Ḥabib, Samuel de Medina, and many others). The large numbers of the Maranos, as well as their wealth and influence, aroused the envy and hatred of the populace, whom the clergy incited against them as unbelieving Christians and hypocrites. The Neo-Christians were hated much more than the Jews, and were persecuted as bitterly as their former coreligionists had been. The first riot against them broke out at Toledo in 1449, and was accompanied with murder and pillage. Instigated by two canons, Juan Alfonso and Pedro Lopez Galvez, the mob plundered and burned the houses of Alonso Cota, a wealthy Marano and tax-farmer, and under the leadership of a workman they likewise attacked the residences of the wealthy Neo-Christians in the quarter Ḍe la Magdelena. The Maranos, under Juan de la Cibdad, opposed the mob, but were repulsed and, with their leader, were hanged by the feet. As an immediate consequence of this riot, the Maranos Lope and Juan Fernandez Cota, the brothers Juan, Pedro, and Diego Nuñez, Juan Lopez de Arroyo, Diego and Pedro Gonzalez, Juan Gonzalez de Illescas, and many others were deposed from office, in obedience to a new statute. Another attack was made upon the Neo-Christians of Toledo in July, 1467. The chief magistrate ("alcalde mayor") of the city was Alvar Gomez de Cibdad Real, who had been private secretary to King Henry IV., and who, if not himself a "converso," as is probable, was at least the protector of the Neo-Christians. He, together with the prominent Maranos Fernando and Alvaro de la Torre, wished to take revenge for an insult inflicted by the counts de Fuensalida, the leaders of the Christians, and to gain control of the city. A fierce conflict was the result. The houses of the Neo-Christians near the cathedral were fired by their opponents, and the conflagration spread so rapidly that 1,600 houses were consumed, including the beautiful palace of Diego Gomez. Many Christians and still more Maranos perished in the flames or were slain; and the brothers De la Torre were captured and hanged. The example set by Toledo was imitated six years later by Cordova, in which city the Christians and the Maranos formed two hostile parties. On March 14, 1473, during a procession in honor of the dedication of a society which had been formed under the auspices of the fanatical Bishop D. Pedro, and from which all "conversos" were excluded, a little girl seems to have accidentally thrown some dirty water from the window of the house of one of the wealthiest Maranos, so that it splashed over an image of the Virgin. Thousands immediately joined in the fierce shout for revenge which was raised by a smith named Alonso Rodriguez; and the rapacious mob straightway fell upon the Maranos, denouncing them as heretics, killing them, and plundering and burning their houses. To stop the excesses, the highly respected D. Alonso Fernandez de Aguilar, whose wife was a member of the widely ramified Marano family of Pacheco, together with his brother D. Gonzalo Fernandez de Cordova ("el gran Capitan"), the glory of the Spanish army, and a troop of soldiers, hastened to protect the Neo-Christians. D. Alonso called upon the mob to retire, but instead of obeying, the smith insulted the count, who immediately felled him with his lance. The people, blinded by fanaticism, regarded their slain leader as a martyr. Incited by Alonso de Aguilar's enemy, the knight Diego de Aguayo, they seized weapons and again attacked the Maranos. Girls were outraged; and men, women, and children were pitilessly slain. The massacre and pillage lasted three days; those who escaped seeking refuge in the castle, whither their protectors also had to retire. It was then decreed that, in order to prevent the repetition of such excesses, no Marano should thenceforth live in Cordova or its vicinity, nor should one ever again hold public office. Like the persecution of the Jews in 1391, the attackon the Maranos in 1473 spread to other cities. At Montoro, Bujalance, Adamur, La Rambla, Santaella, and elsewhere, they were killed, and their houses were plundered. At Jaen the populace was so bitter against them that the constable Miguel Lucas de Iranzo, who undertook to protect them, was himself killed in church by the ringleaders (March 21, 22). The Maranos were fiercely attacked by the populace in Andujar, Ubeda, Baeza, and Almodovar del Campo also. In Valladolid the populace was content with plundering the Neo-Christians, but the massacre was very fierce at Segovia (May 16, 1474). Here the attack, instigated by D. Juan Pacheco, himself a member of a Marano family, was terrible; corpses lay in heaps in all the streets and squares, and not a Neo-Christian would have escaped alive had not the alcalde Andreas de Cabrera interfered. At Carmona every Marano was killed. The introduction of the Inquisition was bitterly opposed by the Maranos of Seville and other cities of Castile, and especially of Aragon, where they rendered considerable service to the king, and held high legal, financial, and military positions. As D. Miguel Lucas de Iranzo, constable of Castile, had been slain in the cathedral of Jaen, so the inquisitor Pedro Arbues was assassinated twelve years later in the cathedral of Saragossa, the former by Christians, the latter by Maranos. The murderers of De Iranzo went scot-free, while those of the inquisitor were punished most cruelly. Together with the introduction of the Inquisition an edict was issued that henceforth the Jews must live within their ghetto and be separated from the Maranos. Despite the law, however, the Jews remained in communication with their Neo-Christian brethren. "They sought ways and means to win them from Catholicism and bring them back to Judaism. They instructed the Maranos in the tenets and ceremonies of the Jewish religion; held meetings in which they taught them what they must believe and observe according to the Mosaic law; and enabled them to circumcise themselves and their children. They furnished them with prayer-books; explained the fast-days; read with them the history of their people and their Law; announced to them the coming of the Passover; procured unleavened bread for them for that festival, as well as kasher meat throughout the year; encouraged them to live in conformity with the law of Moses, and persuaded them that there was no law and no truth except the Jewish religion." All these charges were brought against the Jews in the edict issued by Ferdinand and Isabella, and formed the grounds for their banishment from the country. The decree of expulsion materially increased the number, already large, of those who purchased a further sojourn in their beloved home by accepting baptism. The Portuguese Maranos or Christãos Novos clung much more faithfully and steadfastly than their Spanish brethren to the religion of their fathers, bearing the most terrible tortures for the sake of their faith. The scholar Simon Mimi of Lisbon, who would not renounce Judaism even in prison, his wife, his sons-in-law, and other Maranos were enclosed in a wall built up to their necks, the prisoners being left for three days in this agonizing situation. As they would not yield the walls were torn down, after six of the victims had died, and Mimi was dragged through the city and slain. Two Maranos who served as wardens in the prison buried the body of the martyr in the Jewish cemetery at the risk of their lives (Abraham Saba', "Ẓeror ha-Mor," p. 105b; Grätz, "Gesch." viii. 398). The Portuguese, being even more fanatical than the Spaniards, hated the Maranos much more than the Jews, considering them neither Christians nor Jews, but atheists and heretics. Many a Portuguese preferred death to being treated by a Marano physician. The hatred which was felt for the Maranos, and which had long smoldered, broke out at Lisbon. On April 17, 1506, several Maranos were discovered who had in their possession "some lambs and poultry prepared according to Jewish custom; also unleavened bread and bitter herbs according to the regulations for the Passover, which festival they celebrated far into the night." Several of them were seized, but were released after a few days. The populace, which had expected to see them punished, swore vengeance. On the same day on which the Maranos were liberated, the Dominicans displayed in a side-chapel of their church, where several Neo-Christians were present, a crucifix and a reliquary in glass from which a peculiar light issued. A Neo-Christian, who was so incautious as to explain this ostensible miracle as being due to natural causes, was dragged from the church and was killed by an infuriated woman. A Dominican roused the populace still more; and two others, crucifix in hand, went through the streets of the city, crying "Heresy!" and calling upon the people to destroy the Maranos. All Neo-Christians found in the streets were killed; and a terrible massacre ensued. More than 500 Maranos were slain and burned on the first day; and the scenes of murder were even more atrocious on the day following. The innocent victims of popular fury, young and old, living and dead, were dragged from their houses and thrown upon the pyre. 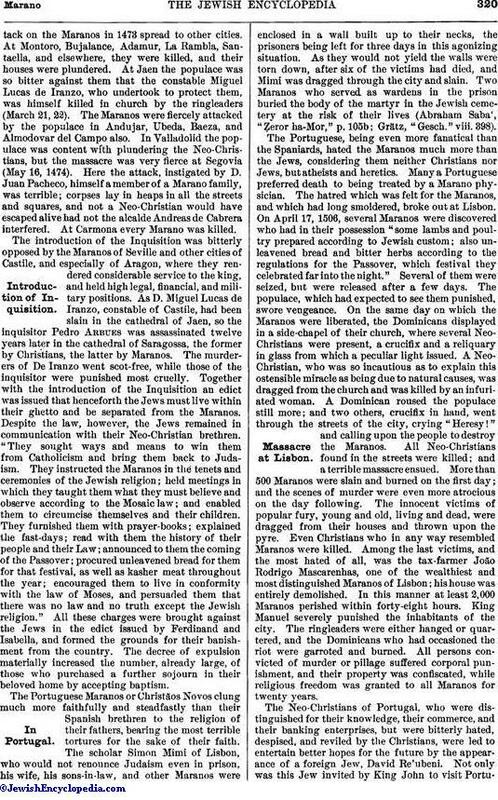 Even Christians who in any way resembled Maranos were killed. Among the last victims, and the most hated of all, was the tax-farmer João Rodrigo Mascarenhas, one of the wealthiest and most distinguished Maranos of Lisbon; his house was entirely demolished. In this manner at least 2,000 Maranos perished within forty-eight hours. King Manuel severely punished the inhabitants of the city. The ringleaders were either hanged or quartered, and the Dominicans who had occasioned the riot were garroted and burned. All persons convicted of murder or pillage suffered corporal punishment, and their property was confiscated, while religious freedom was granted to all Maranos for twenty years. The Neo-Christians of Portugal, who were distinguished for their knowledge, their commerce, and their banking enterprises, but were bitterly hated, despised, and reviled by the Christians, were led to entertain better hopes for the future by the appearance of a foreign Jew, David Re'ubeni. Not only was this Jew invited by King John to visit Portugal;but, as appears from a letter (Oct. 10, 1528) of D. Martin de Salinas to the infante D. Fernando, brother of the emperor Charles, he also received permission "to preach the law of Moses" ("Boletin Acad. Hist." xlix. 204). The Maranos regarded Re'ubeni as their savior and Messiah. The Neo-Christians of Spain also heard the glad news; and some of them left home to seek him. The rejoicing lasted for some time; the emperor Charles even addressed several letters on the matter to his royal brother-in-law. In 1528, while Re'ubeni was still in Portugal, some Spanish Maranos fled to Campo Mayor and forcibly freed from the Inquisition a woman imprisoned at Badajoz. The rumor spread at once that the Maranos of the entire kingdom had united to make common cause. This increased the hatred of the populace, and the Neo-Christians were attacked in Gouvea, Alemtejo, Olivença, Santarem, and other places, while in the Azores and the island of Madeira they were even massacred. These excesses led the king to believe that the Inquisition might be the most effective means of allaying the popular fury. The Portuguese Maranos, waged a long and bitter war against the introduction of the tribunal, and spent with some satisfactory results immense sums to win over to their cause the Curia and the most influential cardinals. The sacrifices made by both the Spanish and the Portuguese Neo-Christians were indeed astonishing. The same Maranos who from Toledo had instigated the riot of the communes in 1515, Alfonso Gutierrez, Garcia Alvarez "el Rico" (the wealthy), and the Zapatas, offered through their representative 80,000 gold crowns to Emperor Charles V. if he would mitigate the harshness of the Inquisition ("R. E. J." xxxvii. 270 et seq.). All these sacrifices, however, especially those made by the Mendes of Lisbon and Flanders, were powerless to prevent or retard the introduction of the Holy Office into Portugal. The Maranos were delivered over to the popular fury and to the heartless servants of the Inquisition. They suffered unspeakably. At Trancoso and Lamego, where many wealthy Maranos were living, at Miranda, Viseu, Guarda, Braga, and elsewhere they were robbed and killed. At Covilhão the people planned to massacre all the Neo-Christians on one day; and to achieve this the more easily, the prelates petitioned the Cortes in 1562 that the Maranos be required to wear special badges, and that the Jews in the cities and villages be ordered to live in ghettos as before. The Maranos, who were constantly threatened and persecuted by the Inquisition, tried in every way to leave the country, either in bands or as individual refugees. Many of them escaped to Italy, attracted thither by the climate, which resembled that of the Iberian Peninsula, and by its kindred language. They settled at Ferrara, and Duke Ercole I. d'Este granted them privileges, which were confirmed by his son, Alfonso I., to twenty-one Spanish Maranos, physicians, merchants, and others (ib. xv. 113 et seq.). Spanish and Portuguese Maranos settled also at Florence; and Neo-Christians contributed to make Leghorn a leading seaport. They received privileges at Venice, where they were protected from the persecutions of the Inquisition. At Milan they materially advanced the interests of the city by their industry and commerce, although João de la Foya captured and robbed large numbers of them in that region. At Bologna, Pisa, Naples, Reggio, and many other Italian cities they freely exercised their religion, and were soon so numerous that Fernando de Goes Loureiro, an abbot from Oporto, filled an entire book with the names of the Maranos who had drawn large sums from Portugal and had openly avowed Judaism in Italy. In Piedmont Duke Emanuel Philibert of Savoy welcomed the Maranos from Coimbra, Pablo Hernando, Ruy Lopez, and Rodriguez, together with their families, and granted them commercial and industrial privileges, as well as the free exercise of their religion. Rome was full of Maranos. Pope Paul III. received them at Ancona for commercial reasons, and granted complete liberty "to all persons from Portugal and Algarve, even if belonging to the class of Neo-Christians." Three thousand Portuguese Jews and Maranos were living at Ancona in 1553. Two years later the fanatical Pope Paul IV. issued orders to have all the Maranos thrown into the prisons of the Inquisition which he had instituted. Sixty of them, who acknowledged the Catholic faith as penitents, were transported to the island of Malta; twenty-four, who adhered to Judaism, were publicly burned (May, 1556); and those who escaped from the Inquisition were received at Pesaro by Duke Guido Ubaldo of Urbino. As Guido was disappointed, however, in his hope of seeing all the Jews and Maranos of Turkey select Pesaro as a commercial center, he expelled (July 9, 1558) the Neo-Christians from Pesaro and other districts (ib. xvi. 61 et seq.). Many Maranos were attracted to Ragusa, formerly a considerable seaport. In May, 1544, a ship landed there filled exclusively with Portuguese refugees, as Balthasar de Faria reported to King John. At this same period the Maranos were seeking refuge beyond the Pyrenees, settling at St. Jean de Luz, Tarbes, Bayonne, Bordeaux, Marseilles, and Montpellier. They lived apparently as Christians; were married by Catholic priests; had their children baptized, and publicly pretended to be Catholics. In secret, however, they circumcised their children, kept the Sabbath and feast-days as far as they could, and prayed together. King Henry III. confirmed the privileges granted them by Henry II., and protected them against such slanders and accusations as those which a certain Ponteil brought against them. Spanish and Portuguese Maranos petitioned Henry IV. to permit them to emigrate to France, saying that should he do so, a large number of their fellow sufferers, "good men all of them," would choose France as their home; but many Neo-Christians who entered French territory were obliged to leave within a short time. Under Louis XIII. the Maranos of Bayonne were assigned to the suburb of St. Esprit. At St. Esprit, as well as at Peyrehorade, Bidache, Orthez, Biarritz, and St. Jean de Luz, they gradually avowed Judaism openly. 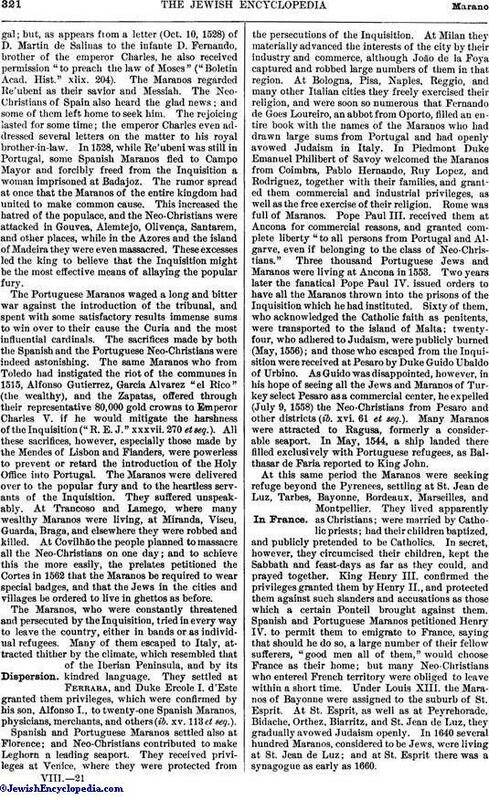 In 1640 several hundred Maranos, considered to be Jews, were living at St. Jean de Luz; and at St. Esprit there was a synagogue as early as 1660. Next to Turkey the Maranos turned chiefly to Flanders, attracted by its flourishing cities, such as Antwerp, where they settled at an early date, and Brussels. Before the end of the sixteenth century Portuguese Maranos, under the leadership of Jacob Tirado, arrived at Amsterdam. So many others followed these that the city was called a new Jerusalem, while hundreds of Neo-Christian families settled at Rotterdam also. Maranos from Flanders, and others direct from the Pyrenean Peninsula, went under the guise of Catholics to Hamburg and Altona about 1580, where they established commercial relations with their former homes. Christian IV. of Denmark invited some Neo-Christian families to settle at Glückstadt about 1626, granting certain privileges to them and also to the Maranos who came to Emden about 1649. Large numbers of Maranos, however, remained in Spain and Portugal, despite the extensive emigration and the fate of countless victims of the Inquisition. The Neo-Christians of Portugal breathed more freely when Philip III. came to the throne and by the law of April 4, 1601, granted them the privilege of unrestricted sale of their real estate as well as free departure from the country for themselves, their families, and their property. Many, availing themselves of this permission, followed their coreligionists to Africa and Turkey. After a few years, however, the privilege was revoked, and the Inquisition resumed its activity. But the Portuguese who were not blinded by fanaticism perceived that no forcible measures could induce the Maranos to give up the religion of their fathers. Individual Neo-Christians, as Antonio Fernandez Carvajal and several from Spain, Hamburg, and Amsterdam, went to London, whence their families spread to Brazil, where Maranos had settled at an early date, and to other countries of America. The migrations to Constantinople and Salonica, where refugees had settled after the expulsion from Spain, as well as to Servia, to Rumania and Bulgaria, and even to Vienna and Temesvar, continued down to the middle of the eighteenth century. 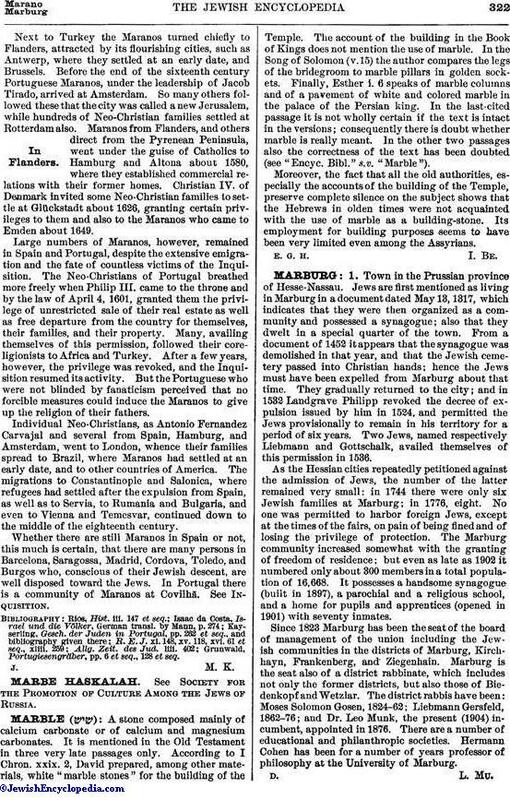 Whether there are still Maranos in Spain or not, this much is certain, that there are many persons in Barcelona, Saragossa, Madrid, Cordova, Toledo, and Burgos who, conscious of their Jewish descent, are well disposed toward the Jews. In Portugal there is a community of Maranos at Covilhã. See Inquisition. Grunwald, Portugiesengräber, pp. 6 et seq., 128 et seq.